scoring a goal during extra time. Well, I would be lying if I said, "I really know what's going on at Wimbledon." Except for a few updates...okay, I'd still be lying. There's something much larger going on right now and I can't be bothered with tennis, a sport I love so much. Another sport, soccer, is having its World Cup right now. I began playing soccer as a child down here in the South when most people were clueless if you mentioned the sport of soccer and you dared calling it football. I was selected for the All-State team and went on to college to play and I should have looked at other colleges I didn't know were looking at me (long story). But, I never called soccer, football. There's good reason - to prevent confusion and also to avoid some angry fans of the other game I also like, from making ignorant comments about the one I was playing at the time. I have played and still enjoy all the above, and although I'm not a regular at the waffle table, if you mention Belgian waffles, I may take a seat. More on this later. No Americans, male or female, made it to the Round of 16 at Wimbledon in singles. They are either in the stands, back at home with their families or off somewhere with their coach planning for the next tournament. They were competing as U.S. individuals. It's not as if the Davis Cup or Fed Cup was being played, but it is a Grand Slam tournament and most of us Americans pull for or at least identify with our fellow citizen pro players when playing abroad. 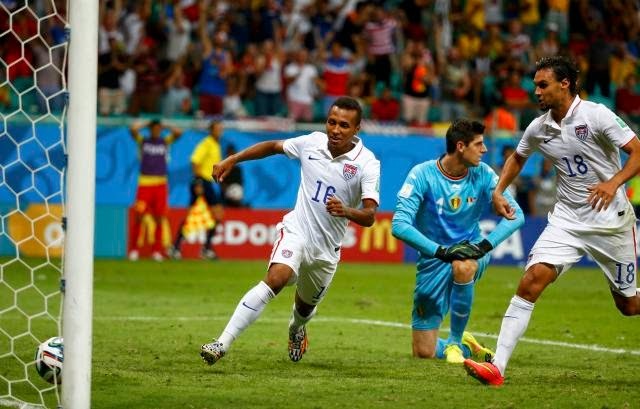 The U.S. soccer team did make it to the Round of 16, as they have before in the World Cup, but were prevented from making it to the quarter-finals by Belgium (purported creators of the Belgian waffle) in extra-time (over-time) 2 to 1. If you know or have played the game long enough and watched our play in the World Cup, you may have been dismayed by the formations we used, the lack of ball control and possession, and perhaps some of coach Klinsmann's decisions. Nonetheless, we worked with what we had in our armory, the general had his plan and best of all, we saw more and more Americans get interested and excited about this sport than ever. We toughed it out. Ask our goalie, Tim Howard. If you don't understand or even appreciate soccer, I get it. My only exposure to professional soccer as a kid was from watching German football on PBS and the good fortune of a YMCA coach from England who had Pele (world-renown Brazilian player) training films sponsored by Pepsi. My coach actually worked for Coca-Cola. Knowing soccer comes from either playing it or having exposure to it on or at the field, growing up with it in your family or community, just like most other sports. It's difficult to understand or appreciate all that is taking place on the field without having this. I don't wave a soccer banner, get fanatical about much of anything and take little offense to someone who bashes the sport. It's a game one does not have to learn, nor love - just like all the others. We are a country of money and marketers and if there ever was a strong push to popularize soccer it in the United States is was when Pele joined the roster of the New York Cosmos in the original NASL (North American Soccer League) in 1975. Unfortunately, along with Pele's retirement just a few years later, the massive amount of game coverage and attendance overall waned until the NASL folded in 1984. Fortunately, during those days, soccer youth camps and leagues sprung up across the country and there began the throng of American players and fans we see today. As with most sports, the more popular they are in the neighborhoods, schools and communities, the more likely we will later have generations of athletes in and followers of those sports. It just took about four or five generations for soccer to get where it is now. The field is huge - it's like trying to watch a basketball game played on an aircraft carrier with someone hanging out by the basket and he's the only player who can use his hands. And, no one can seem to get the camera coverage adequate to see everything going on. It's one of the few sports (except the various versions of hockey) whereas you never truly have possession of the ball, therefore control (both individual and team-wise) is a huge issue and it can slow down field progression. That's the part of the game worth knowing to enjoy watching it. Some of the passes, shots, traps and tackles are quite impressive when you know what all is involved. Understanding fouls, free kicks, penalties, yellow and red cards and why and when they are called/issued (or not) is a whole other topic. I often get confused or maybe the referees and the assistant refs do. It's probably me. No time-outs, no commercials. Except for the bathroom break or the next beverage, I'm not complaining. Which sport do you think helped create those rotating sideline advertisements so TV coverage was economically viable? Low final scores are a huge complaint of many Americans and acceptable ties are probably tougher (more below). Okay, so we can make a goal scored worth nine points. Would that truly make a difference? Actually, marketing-wise, it probably would to some fans, although it would mean absolutely nothing to the game or how it's played. Remember, huge field, 22 guys who can't hold or carry the ball and 2 guys who basically can within their domain, protecting an eight yard wide by eight foot tall goal along with a few of their guys. Penalty kick decisions: Ties normally remain ties unless the outcome matters in order to move forward such as in a tournament. We Americans hate losing, but I think we hate a tie even worse. It's obvious you have to be in good, if not great shape, to play soccer, but 90 minutes with a 15 minute break is almost a marathon. Add on 30 more minutes of extra-time and your taxing your body. This is like a best of five singles tennis match with no change-overs or allotted service time. A penalty kick shoot-out is not a bad option. Give it a try. If you don't know the game, hang out with some friends that do, played or still play. If not, okay. Soccer is not going to replace our football (I said it. ), nor any of our other major sports. I don't even know what replace truly means in this case. It's irrelevant. Our football is never going to go away. For many, even those not truly fans, you can feel football coming this time of year, particularly if you are a college fan, a high school student or parent of one. Football is huge, dynamic and a multi-billion dollar industry and more than anything else, it is an event. Even though I enjoyed extremely my time hanging out at a pub watching, cheering/cringing and discussing the U.S. versus Belgium World Cup match yesterday with a bunch of fans, the quantity of which I have never noticed at a Gamecocks away football game, I can't wait for the the Gamecock's first-game kick-off. Like the commercials says, just call soccer futbol for a while. As for tennis, we have seen the decline of our U.S. players making it well into the late stages of major tournaments, but tennis is not going away either. Tennis is one of the most athletic sports played by so many for a lifetime. As long as families keep playing and those people, who take it up later in life, keep playing, we'll be okay. Oh, yesterday, while watching the world cup match, someone recited a list of Belgian things (as the clock ticked and our odds of winning slipped away) he was going to avoid. I consider myself (not sure about anyone else) to be a fairly smart and worldly guy. I don't know if this guy once lived in Belgium or took a course on it. He rattled off about ten Belgian things and I could only come up with three: diamonds, beers and waffles. Come to find out through Wikipedia (Not normally my sole source, but I'm gonna run with it.) that there is no waffle in Belgium known as a Belgian waffle, although the guy who introduced it to North America was from Brussels, Belgium, which does have claim to the home of Brussels sprouts. I don't know if Belgian sprouts would have made these miniature cabbages any more tasty (great when creatively prepared), but it sure does make those waffles more appealing or perhaps the waffles make Belgium more appealing, which it is not right now because they knocked us out the World Cup.